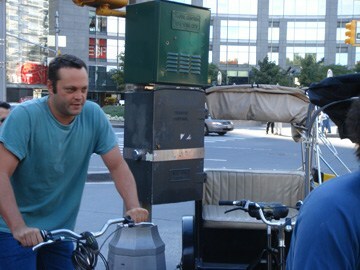 Vince Vaughn getting ready for a ride in Central Park. I know some people that seem to bump into celebs all the time on the street. I'm not one of them. But I've had a handful of run-ins and these rank as the best moments. Picture a guy out in broad daylight yelling out "Hey turkey, hey turkey" and addressing a human being. That's pretty cool. Now what if I told you that individual was Vince Vaughn? Even cooler. Vince was getting ready to bike in Central Park with his buddy, the aforementioned "turkey". My wife was with me at the time and snapped a quick shot. Vince noticed and she told him that she just took a photo of him. He simply responded in a very nice manner, "Oh, okay!" Another passerby asked Vince how he's doing, and once again, he responded in a very friendly, laid-back way. No pretense. Just like his characters. On a weekday night, Jimmy Fallon comes stumbling into this bar that I'm at with his buddy. He's obviously plastered. But in a friendly kind of way. He was just smiling and enjoying a drink. He knocks over bar stools like dominoes, and he accepts taking photos with some of the women at the bar. We just looked up, and we're like, "Hey, that's Jimmy Fallon." Turns out, he frequented The Gaf quite a bit in the early 2000s. This was a different kind of celebrity encounter because Donovan was hired by the agency I was working at to be a spokesperson for some Verizon promotions. What struck me about this encounter was how low maintenance he was. He came into the recording studio with a childhood buddy and a bag of Wendy's. Cheeseburger, fries, and a shake, I think. Before he started doing his reads, he was just chatting with us, eating his Wendy's, and being very cool. The kind of guy you wanted to go have a beer with. And when it came to recording the voiceover, he did exactly what we wanted without any attitude.